Message "the stone of sanctuary and stumbling"
I�ve brought some blocks from the pre-school room to play with this morning. I thought I might build part of a castle this morning, actually - just two of its walls. Do any of you like building with blocks? Good. I thought you might. You�re welcome to help me, but you must do what I tell you. Okay? In building this castle, I need to start somewhere. Whenever you build something, you have to start somewhere, and the best place is in a corner. In fact, when people build a real castle, or a real house, they always start at a corner. Did you know that? Let me lay down the very first block. If I were using stones to build my castle, this would be known as the "cornerstone." It�s a very important block. Once it is laid, it�s easier to figure out how the rest of the castle will be built. It also is important because it bears a lot of the weight of the walls. Now that this corner block is down, let�s build our walls (direct the children to lay down a 3 block by 2 block foundation for 2 walls forming a 90� angle - note picture below. 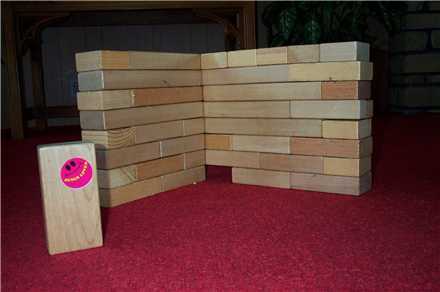 Using the rest of the blocks, build up this wall as high as you can. Your primary blocks should be 5�" x 2�" x 1�" or equivalent, as much as possible). I like playing with building blocks, how about you? Now, I know this is not going to be a complete castle, but I want us to see a bit of what it looks like. Try to imagine the rest. We now have a portion of our castle built. Carefully, without actually trying to knock it over, come over here and feel how sturdy the corner of these walls are. These walls will not easily fall down. They�d be even sturdier, of course, if we had the whole castle up, but we don�t have enough blocks or time to do that this morning. Now, let me carefully take out that first block I laid, the "cornerstone" (note the picture above with the block to the left removed from the corner). Now feel how sturdy the wall is. It seems a little wobbly, doesn�t it? That�s because it�s missing the "cornerstone." The "cornerstone" is that important. Let me say something real simple, something the Bible itself says: Jesus is the cornerstone for us. If we were to think about "us" - our families, our church, our very lives - as if we were castles built with blocks, Jesus would be the corner block, the "cornerstone." We need to make sure that he�s the first block we lay at the corner of everything we do. He helps our castle not to fall. He keeps our families from tumbling down. With him as our "cornerstone," our church won�t break apart. When he is the corner block, our lives rise up and become beautiful and sturdy. Without him, we fall apart. Okay, now I�ll let you do what you probably have wanted to do from the beginning. Let�s tear this castle without a cornerstone down, and put it back into the box. Thank you. Would you older ones help the preschoolers take this box back to their room for their time of worshipful play, and then return to your seats. Bye. you will hear their requests. As you hear the following words of Jesus from Luke�s gospel, think about this sanctuary. No, not the physical building which contains this room, made of brick and wood. Ponder, instead, the "sanctuary" of which you and I are the building blocks. Listen. Is this "sanctuary" resting upon a firm foundation, or are we planted on shifting sand? That�s something to meditate upon as you return your offering just now. Ushers?